to gel as a team. 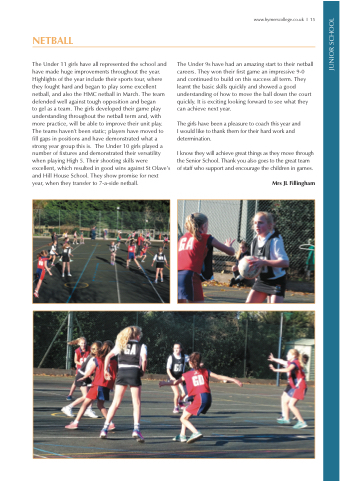 The girls developed their game play understanding throughout the netball term and, with more practice, will be able to improve their unit play. The teams haven’t been static; players have moved to fill gaps in positions and have demonstrated what a strong year group this is. The Under 10 girls played a number of fixtures and demonstrated their versatility when playing High 5. Their shooting skills were excellent, which resulted in good wins against St Olave’s and Hill House School. They show promise for next year, when they transfer to 7-a-side netball. The Under 9s have had an amazing start to their netball careers. They won their first game an impressive 9-0 and continued to build on this success all term. They learnt the basic skills quickly and showed a good understanding of how to move the ball down the court quickly. It is exciting looking forward to see what they can achieve next year. The girls have been a pleasure to coach this year and I would like to thank them for their hard work and determination. I know they will achieve great things as they move through the Senior School. Thank you also goes to the great team of staff who support and encourage the children in games.